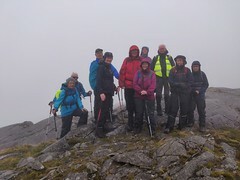 We are a welcoming group for people of all ages in Galway interested in walking and hiking to meet like-minded people. 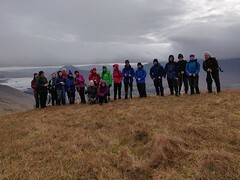 We organise weekly walks, hikes and rambles throughout Ireland, along with regular organised trips abroad, weekends away, summer BBQs and Christmas parties for our members. As of February 2019, we have over 300 members and we always welcome more! Interested in joining? Come along to our next meeting to learn more or to join the club, we meet at 8.30 every second Thursday in Tonery’s pub in Bohermore (upstairs – ask behind the bar; free parking). Registration is NOW open for our Connemara Western Way Annual Walking Marathon and Half Marathon 2019. Open to members and non-members. Saturday 17th August. Click here for more information and to register today. 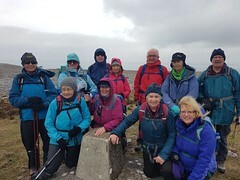 The Club encourages all Walkers doing short Walks & Rambles to wear high vis jackets especially for the winter months & Always proper walking boots and gear. Regroup at: Ballyvaughan in the main car park this side of monks restaurant. 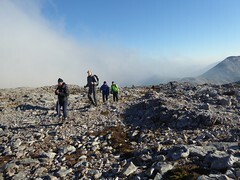 Walk Location: Baureagh Horseshoe which includes Baurearagh Mountain & Caha Mountain 650 metres high, approx. 5.5 hrs. Note: Anyone wanting to do a C Hill would need to do a Ramble first. Walking holiday Gran Canaria January 17th to 25th 2020. Limited places.